Highlights: I really like Milo as a character, and Michael J. Fox’s voice work is of course wonderful. The concept of Atlantis is certainly interesting, and it’s fun to see Disney’s interpretation of it. This was certainly an action packed movie and I think it could keep people hooked. For some reason the first time I watched it several years ago I felt really invested, but on this re-watch I was just rather bored. Low points: The plot was ambitious. I don’t necessarily know if there were plot holes, but there were definitely a few things that were tough to figure out – exactly how much time has passed since Atlantis disappeared? Why do they have this energy crystal that is basically their life force? 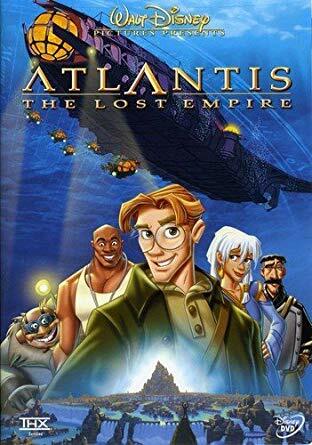 It was a unique take on the Atlantis legend, though hard to follow at times. 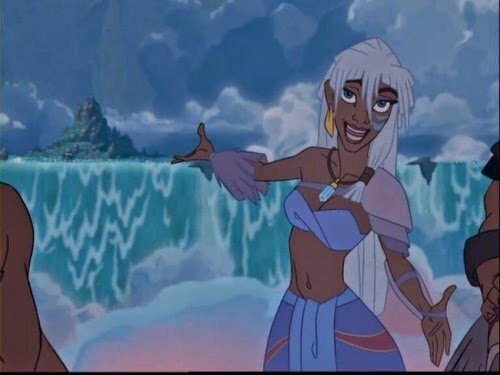 The characters were fun, but aside from Milo,Princess Kida, and maybe a few others, they were pretty much complete caricatures – almost bordering on stereotypes. Really over the top, and while it’s fun to have a few side characters like that, it maybe started to become a bit too much. The Music: In the early 2000’s Disney produced a number of animated movies that were not musicals, like the ones preceding them (Hercules, Hunchback, etc.). 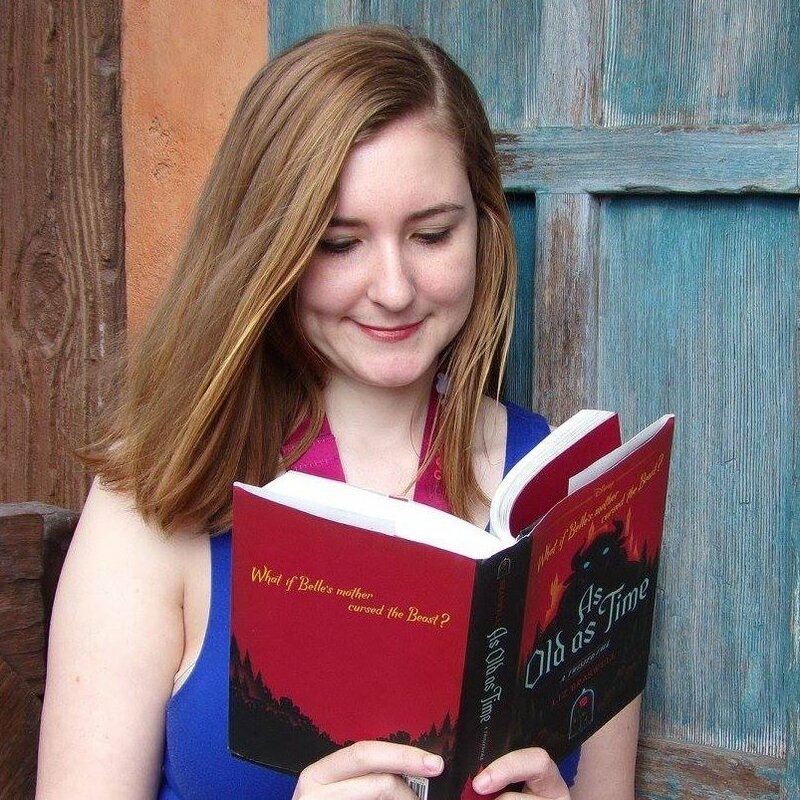 If you’ve read other reviews on this blog you know I love a good musical, and I often feel that the animated Disney films without the characters singing just aren’t as good (Pixar aside). That being said, the soundtrack was fine for this and worked well with the film. The Villain: Rourke fits the villain mold pretty darn well. He’s a tough guy, deceiving, and manages to trick Milo completely. He’s completely blind in the sense that all he cares about is himself and gaining money, and doesn’t care about the people that he’s murdering and the culture he’s destroying. After he reveals himself as the villain he definitely seems pretty insane, which is a fitting villain trait. Definitely up there on the evil scale. Fun fact: This film put a lot of work into developing the Atlantean language. They hired Marc Okrand to create it, who also invented the Klingon language for Star Trek! Where in the World: Is there anything about Atlantis is Disney World? I know a lot about Disney but I certainly can’t think of anything off of the top of my head. If you know of anything please comment so I can add it here! It wasn’t particularly popular or well loved, so it doesn’t really surprise me that the theme parks ignore it. My rating: 5 out of 10. It’s just not my favorite and I don’t have a strong desire to watch it again. Have you seen Atlantis? What do you think of it?